This blog was supposed to be all about "how I organised my daughters 21st. Clearly it isn`t! Having gotten over the excitement and emotional journey of the 21st party, the planning and hosting, I was looking forward to sharing all the details on the decorations, menu planning etc etc. But oh no my "i just can`t be bothered brain" kicked in and to be honest I just wanted curl up on the couch, binge on Netflix while eating chips and beer.....is that so bad really! It was going to be the leftover birthday cake, however I really had a bit too much of it, so I b-lined it to the chips...once the bags open thats it, I can`t stop!. I just felt like I lost my mojo and actually felt pretty overwhelmed! I was feeling really excited as I could now start to "organise and plan" for the pack up and move for the renovations (only got 2 weeks to go before the builders start). 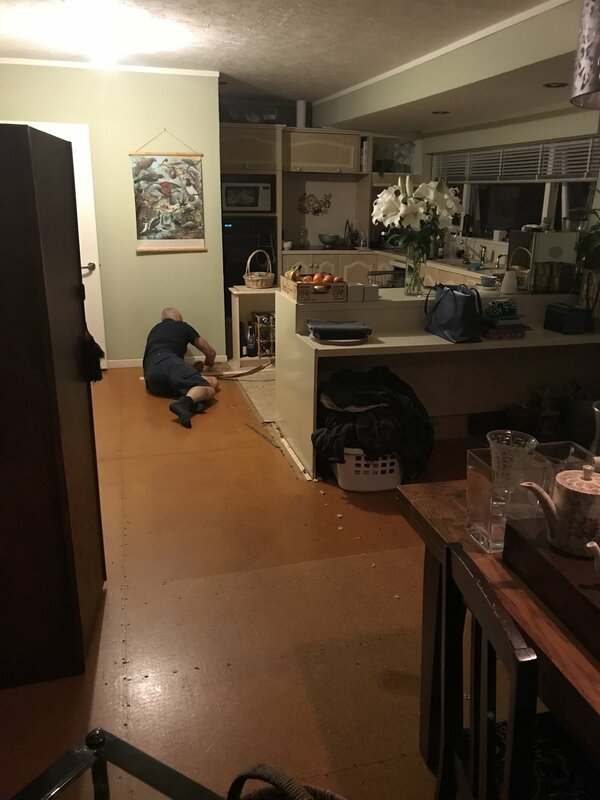 We needed to pack up all of the upstairs which consists of Kitchen, bathroom, ensuite, master bedroom, two guest rooms, dining room, lounge, hallway and entry, so the builders can start to demo and gut the areas. We were going to sit down and plan out this big job, so it could be stressless, nice and orderly! But....!!! I had just finished my yoga, hmm a few down dogs and farts, feeling relaxed and was starting on downloading the photos from the party when I heard, thumping and crashing noises from upstairs. Off I went to investigate and discovered Pete and the neighbour ripping up the carpet in both bedrooms!. Now to explain Pete and I thought it would be a great idea to advertise on Neighbourly (Community website) to give away the carpet as we are replacing it. It would be a great help to us to have someone take it away and reuse. In my silly head I didn`t even think about people would want to come and take it away now. So here I was none the wiser that this was going on and was faced with carpet everywhere and furniture all over the place with stuff pulled out and displaced everywhere...yep you guessed it I was just a tad freaked out as my master plan if a stressless, nice and orderly move had just been blown to outer space...like the dudes rocket who wanted to prove the earth was flat!!! However I had to remain calm and offer my help as it was actually a great thing that the carpet was being removed. Luckily the sheer physical work to move the furniture and roll up the carpet and move took all my energy and my freaking out anxiety...so boom! there was a sliver lining, always got to look for that bloody silver lining. So we continued, moving onto the lounge and the dinning room, shifting the furniture to one side of the room, rolling up the carpet and underlay then shifting the furniture to the other side and rolling the last half, lifting big rolls of carpet into our neighbours Tardis of a van. By 9pm the upstairs was pretty much empty of carpet and well it was a chaotic mess with furniture and stuff all over the place. 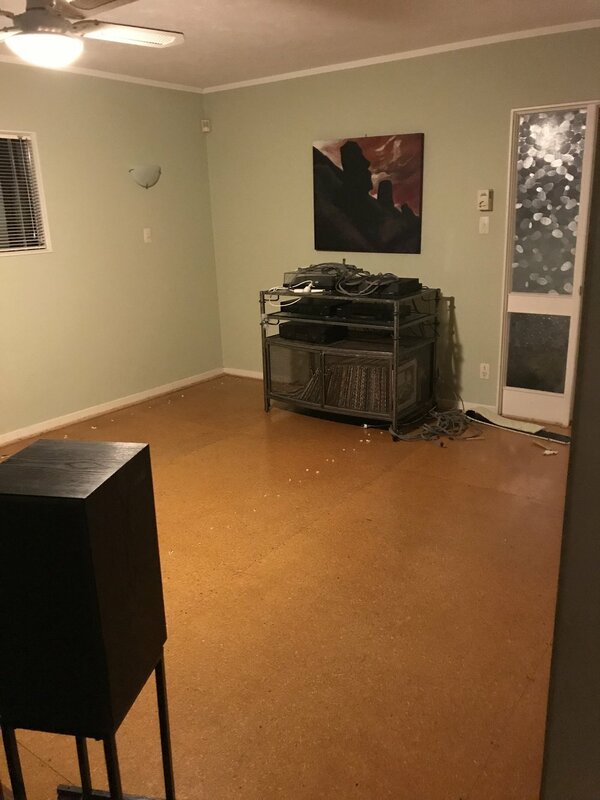 One side of my brain is going, this is great to get rid of all the carpet and so quickly and easily and the other side was running around in circles going, with arms waving in the air going, "OMG...where do I start" . I am not sure about you but I find mess and disorgansiation very stressful.....well I know it's pretty obvious really!. I needed to reset myself and get my mojo back!. The cat's present of the dead mouse on the stairs didn't help much either! So this blog is more about me sharing my reality at the moment and trying to get a sense of calm amongst my chaos!!! arggghhh. In some ways this is about me putting into practice what I preach!! One of the first things I always do when feeling like this is to do a brain dump, listing out everything that you need to do, no order just get it all out. It does help me to resume normal transmission. For some reason it always makes me feel better getting this listed out, the good old brain dump. It's a bit like the rebooting the computer!. So starting to feel better now and like "you got this"! The next mission is to work out what to do first, yep the good old prioritise. I find that working backwards helps, not literally of course but in terms of the timeframes. To help me do this I use this simple printable resource from Strange & Charmed . There are really good planning resources on this site and Alexis has great videos and other resources available so check it out. Now that I have the two goals stated it is a lot easier to work through the big to do list and "allocate" them to the appropriate goal. Having detailed the timeframe as well so I can work out what actions need to be done when to ensure I get the end goal achieved within my timeframe. The last step is to work through the number of days left and assign the actions over each day, ideally leaving a free day on the last day. On which I will be sleeping in and watching Netflix while eating Sour cream & chive potato chips and drinking beer!!! I can not exactly tell you when I first started using planners, or what I called diaries, I think it was at High school or Varsity. It was always on my Christmas wish list and I loved filling it all out for the new year......a bit like starting over, a fresh new year ...well I think that's why I loved it...thinking of all the possibilities and adventures that were coming that year. Now we have "life planners", "goal planners" basically whatever planner you want. They are ohhhh so much more than just the basic yearly diary, they are great for getting you and your life organised. And the choice.... oh the choice, its endless plus there is the fun of making them all pretty by jazzing them up with stickers and custom tabs and washi tap.....limited only by your imagination. As it is January and my traditional time of the year for my new year planner , I thought I would take you through my personal planner set up for 2017....excited cos I am! The planner itself is from Kikki k which I got as a Christmas present at the end of 2015. I absolutely love using it. It's not only functional but allows me to personalise it. I alway starts with the functional aspect then jazz it up, making it all pretttttyyyy ...so every time I open it I am filled with joy....wiggle bum!!!! Guys this is probably your equivalent to getting all the sports settings set up properly on your TV/Streaming device ..one stop shop for everything. For the inserts you can get the pre printed packs from Kikki K, however I can never find ones that has exactly what I want, so I go online. As there are soooo many planning choices out there on line, I'd suggest to use Pinterest to narrow the search. This year I have purchased some planning printable bundles from the website Strange & Charmed. Aka 'Miss Trenchcoat' , she provides tools and resources to help online entrepreneurs succeed and she has great functional planning resources. As I purchased and downloaded the inserts I was able to use them for both my personal and business planner, so it is certainly a cheaper option (even including the printing). The great thing this year was that she provided them in A5 and A4 size, perfect for me. Each category is in its own section and separated by a divider, which I have personalised...sooo much fun.....and I love the look I achieved this year. My monthly and weekly view are on two pages, this just means when I open it out it is over two pages. This gives me plenty of space to write. 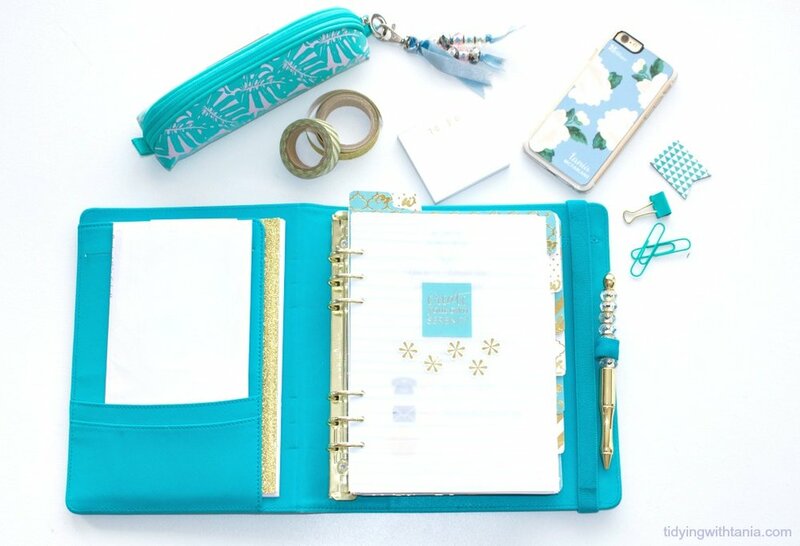 The rest are all on one page with the exception of the reflection pages, which are actually from Kikki K.
If you are a planner then you know that it takes a while to get the right system that works for you. The way I use my planner, essentially is based on a month by month view. All events, birthdays and appointments are noted firstly in the monthly view. Therefore at the start of each month I review what is coming up for the month, add in any additional appointments, events etc. Every Sunday morning I plan up the week ahead, this means that I can see easily what is planned for the week and what I need to get done. I also run a task list, or a "to do" list, so I review this list at the same time and essentially divide up the tasks over the week depending on the priority and the time. One thing that I do slightly differently is that I have a daily view for the weekends, one day on a page where I can time block . I actually find these really helpful for planning out things to get done in the weekend. I don`t know about you but I always have 101 things to get done in the weekend, so this works perfectly for me and ensures I get the important things done. Last year I started doing a weekly reflection, it is not really something that I thought I would get into ... a bit fluffy for me...however I actually found it really useful. So this year I am continuing do this. Is there such a word? No suspect not but hey I have made it one now. This is where I have fun with my planner, as an FYI, planner embellishment is big business as is Planners in general. In short this is Scrapbooking for diaries. And yes I am a Scrapbooker from way back so it's a given that I got into planners. I actually make my own dividers. I take the original dividers that came with the planner and each year I cover them with updated card stock. My colour theme is gold and teal/turquoise or acqua or whatever colour you call it. Each divider has a tab , this year I have gone all out and tried something different, just used a gold letter rather than the word on the tab, i.e m for monthly (actually it was an w upside down as I didn`t have any m`s left). I have to say I am in love with the look!! So there you have it my planner for 2017. I hope this has inspired you to consider starting to use a planner....you never know it might change your life. If you are keen to learn more about using a planner and functional planning let me know, am happy to share the love!